MSE Creative Consulting Blog: Tornado Season Rapidly Approaching! 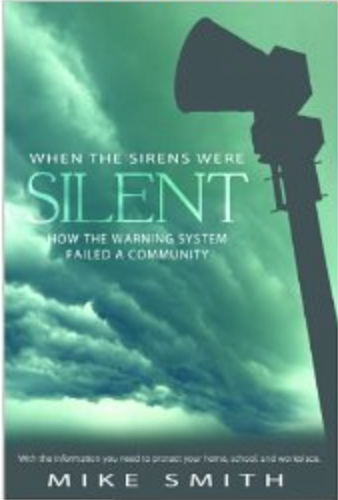 As the 2016 tornado season approaches, may I modestly recommend my book, When the Sirens Were Silent, which is the story of what went wrong with the warning system during the Joplin tornado. As you know, Joplin (161 deaths) is the only tornado to cause triple-digit tornado fatalities since the warning system was created. The book also includes complete tornado safety rules for businesses, for schools and for home. Sirens is probably the best bargain around with a price of $2.99; but it is available now in Kindle only as the paper books sold out very quickly. The Barnes & Noble Nook version is here. The Amazon Kindle (plus the free cloud reader, you don't need a Kindle to read this version) is here. It is a quick read that will help you and your family take the warning system seriously if a tornado warning is issued this spring. This is a great book. If you are interested in severe weather or in the story of the Joplin Tornado, you'll like this book. Mike does a great job of researching some of the physical and psychological reasons why so many people were caught off guard by the Joplin tornado.